Shiva is one of the powerful Gods in Hinduism. He is identified by a third eye on the forehead, serpent around the neck, crescent moon on his braided crown and with his attributes Trident and Damaru. 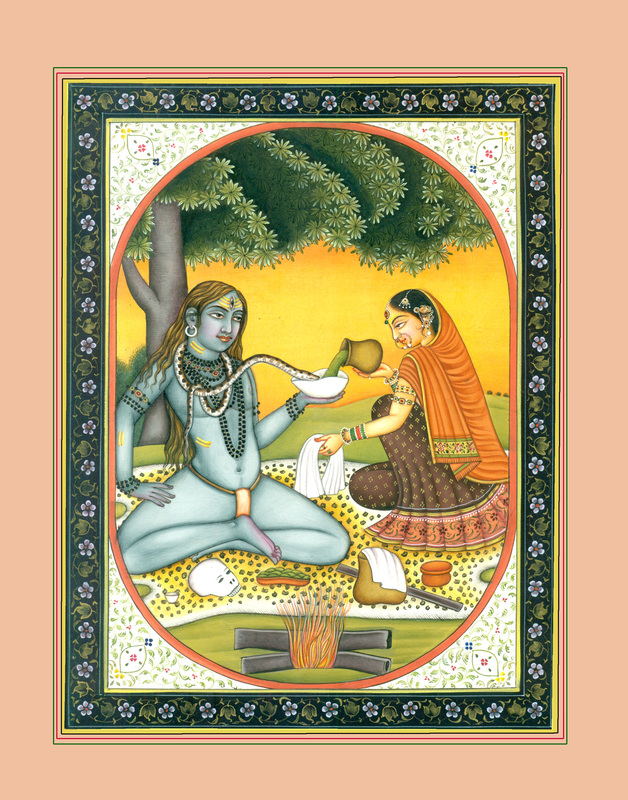 In this painting, Shiva seated under tree upon a deer skin carpet as a beggar for getting alms. His hair is not tied and hanging on his shoulders. He is wearing Rudraksh garlands and having serpent around his neck. The carpet contains scalp and other utensils. The bon-firing is also depicting near the carpet. Parvati, Consort of Shiva who worshiped a lot to get married with Shiva. In the scene, Parvati serving drink to Shiva (as beggar) without knowing that he is Lord Shiva himself. The serpent is rushing to have sip of the drink before Shiva. Parvati, with very calm face, wearing decorated brown Lehenga and thick red coloured odhani which is covering her head and shoulders. She is adorning with earrings, nose-ring, hair ornaments, armlets and bangles. She is holding a white cloth in her right hand and left hand carrying pot of drink. The painting may have influence of Deccan School of miniature paintings.